控制和監視多達 4 個攝像頭兼容所有攝像頭自動攝像頭檢測連接到系統時平移，傾斜和縮放調整覆蓋區域支持多監視器以隱藏模式操作錄製連續視頻或觸發警報時在錄音上添加日期時間標記或水印自動將錄音上傳到您的 FTP 帳戶安排視頻錄製在指定時間開始和停止錄製視頻，拍照，發送電子郵件，FTP 上傳可調節的運動靈敏度掩蓋不需要的區域，以避免提高虛假警報獲取帶有附加照片的電子郵件通知按日期分析視頻記錄和照片按日期時間順序快速查看事件使用活動的消息欄查看所有攝像機的運行狀態自動刪除舊媒體文件以釋放磁盤空間廣播在互聯網上觀看實況視頻注意：允許您在演示版本中連續監視 2 小時. - Better Stability: Efficient CPU and memory utilization provides faster application response. - Secure Access: Lock the settings with a password so others can only watch the camera preview and view the motion events. Prevents users from stopping monitoring, alerts or closing application. - Improved Email Component: Now automatically detect prototcols that provide communication security over network. - Quick Status Preview: View at a glance whether a camera is broadcasting, uploading, monitoring, or recording. - Improved Test Connection Funtionality: Verify different possibilities of connection to FTP server and auto correct settings. - Auto-retry Uploading: Continue uploading of files to FTP server even after a network glitch. - Organized Event log: View the error events that occur for each camera. You can choose to view all events or only error events for selected camera. - Multi-Language Interface: The application interface can now be displayed in French, German, Italian, Portuguese and Spanish. 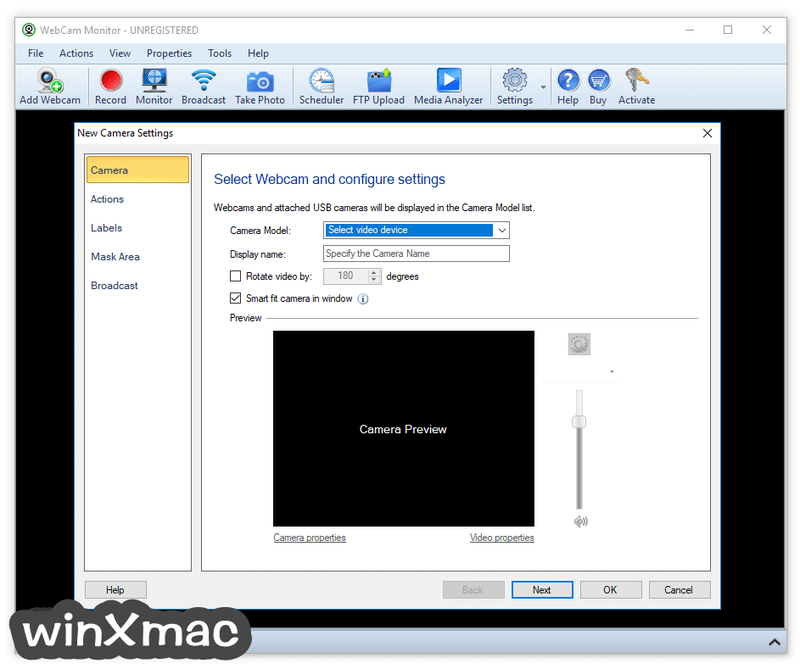 - Windows 10 compatibility: WebCam Monitor fully supports the Windows 10 Operating System. - Prevent false alarms: New motion controls allow you to adjust when an alert should be triggered. - Now you can specify seconds time format to start actions: Quickly start the actions such as Video Recording, Take Photo, Email Notifications or FTP Upload in seconds. - Easily configure the audio settings for each camera: With the help of newly updated audio control, change the audio volume settings for each camera separately. - Control the time between sending emails: During continuous motion, regulate the time between sending Email alerts. 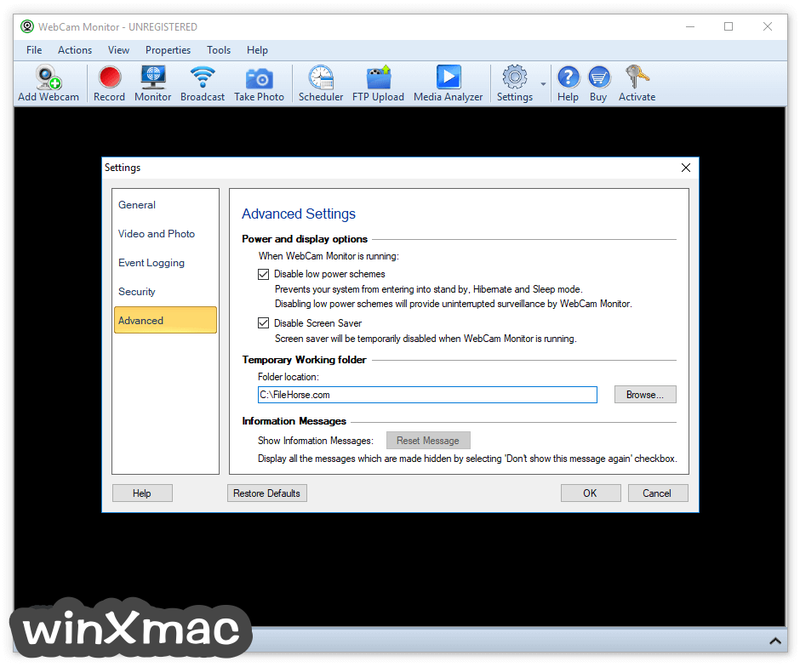 - Automatic update notification: Review updates and easily install the latest version of WebCam Monitor as soon as it is released. 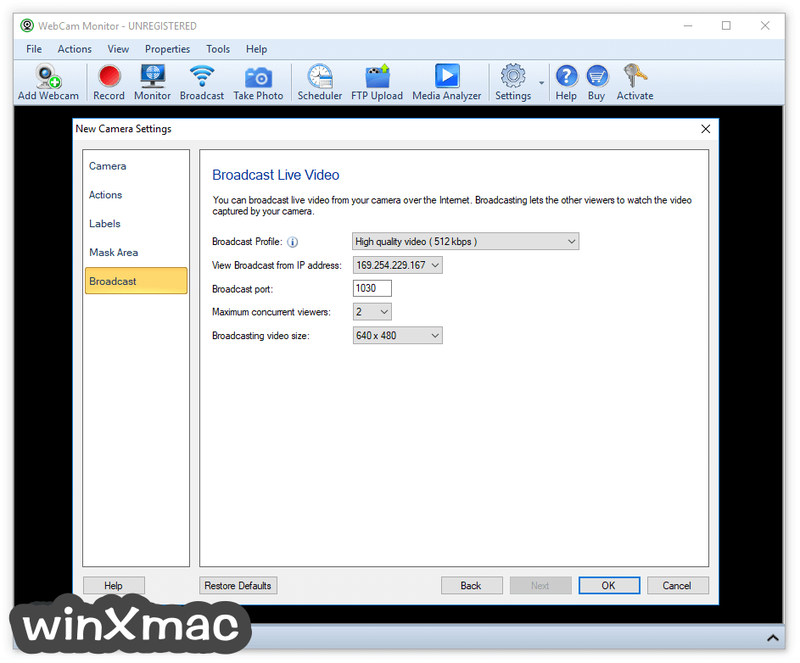 - Support for Windows 8: WebCam Monitor is fully compatible with Windows 8 in both 32 bit and 64 bit versions. - All-new design: The new look of WebCam Monitor is more user friendly, simplified and easy-to-customize. - Multi-Monitor support: Camera previews can be detached from the main interface. Arrange the camera previews on any monitor on your system allowing you to work with other applications while keeping an eye on your surveillance. - Auto-detect WebCam: Auto-discovers a webcam when plugged in to your PC and provides options for configuration. - Active Message Bar: View a running status of all camera actions. - Powerful E-mail control: Each camera can send alerts to a different e-mail address. During continuous motion, you can now control the number of e-mails sent. Get email notification when a camera is disconnected. - Hidden Mode: Run the program in the background, hidden from normal users. - Watermarks: Authenticate your video recordings and photos with custom watermarked logos and date and time stamps. - Enhanced real-time notifications: Be informed when there is a network connection problem, when disk space is running low, a camera connection is lost, and more. - Superior FTP: Every camera has it's own FTP settings to upload into specific folders or onto individual FTP servers. Backup videos, photos or both. Optionally remove the local files after upload. - Improved Event logging: View camera events for specific camera or all cameras. - Easier navigation: Jump to the next or previous camera by clicking on the navigation buttons or selecting a camera from the thumbnail preview. - Customize camera positions: Drag and drop the cameras within Thumbnail preview to adjust their positions. - Theme support: Apply coordinated color themes of blue, black, or silver for a pleasing view.